Mister Rogers arrives empty-handed but has a synthesizer waiting inside the house to show viewers. As he demonstrates the various sounds made by the synthesizer, viewers are invited to close their eyes and try to guess what sound is being made. 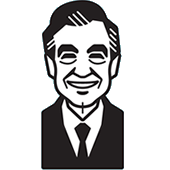 Mister Rogers talks about how by looking and listening carefully in the world, a person will find lots to play with. He then sings Look and Listen. Mr. McFeely stops by with a "person delivery" in the form of Jay O'Callahan. Mr. O'Callahan shares a story about a king who finds himself trapped inside a giant bubble. In the Neighborhood of Make-Believe, Handyman Negri is blowing bubbles for King Friday. The King had recently heard the story about the king who was trapped in the bubble and wants Handyman Negri to make a large bubble that will cover the castle. Handyman Negri tries to explain that the story is just pretend but is quickly reminded that the Neighborhood of Make-Believe is pretend as well. Miss Paulificate brings a phone call from Reardon to King Friday who learns that Reardon will be arriving the next day to plan a new opera -- one with bubbles. Lady Elaine Fairchilde expresses to Handyman Negri that she would like to be a hummingbird in the opera while Francois Clemmons reminds him that anything is possible in Make-Believe. At Daniel's clock, Mr. Clemmons and Daniel practice blowing bubbles while they talk about different feelings. Mr. Clemmons decides that he would like to be a pourpise in the opera. Back at the house, Mister Rogers talks about the upcoming opera as well as the need that all people have to be loved: "Every person that you see in this world needs to be loved. And the marvelous thing about being human is that while we are very much alike, each one of us is very different, too. Isn't it great that we can care about one another the way we do?" Mister Rogers then sings It's You I Like. When Handyman explains that the story King Friday would like to replicate about a king who got inside of a bubble is just pretend, King Friday leans forward and quietly says, "So are we Handyman Negri." Handy responds, "So we are. And we should be able to make a bubble that will last!" Miss Paulificate misunderstands King Friday and brings him a baloney instead of a bubble. King Friday thanks Miss Paulificate for the baloney and instructs her to "feed it to the elves, out back." As Mr. Clemmons and Daniel blow bubbles, they emphasize that their bubbles look the same even though they are different – Mr. Clemmons' bubbles aren't black and Daniel's aren't orange and black. This is one of the closet times the series every comes to explicitly talking about race or color. After Lady Elaine suggests that she will pop bubbles in the opera, she sings "pop goes the bubble" to the tune of Pop Goes the Weasel. Jay O'Callahan is a professional story teller who continues to share his stories today. You can visit Mr. O'Callahan's official website at www.ocallahan.com. © 1980 Family Communications, Inc.